Devialet's new Gold Phantom speaker packs serious power | What Hi-Fi? 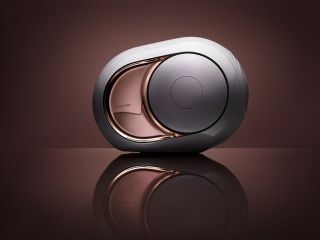 The latest version of Devialet’s wireless Bluetooth speaker has been given more than just a new colour finish. Following the release of the Phantom and Silver Phantom, Devialet has gone back to the drawing board to figure out how it can give its speaker more power. The result is the Gold Phantom which comes packing 4500 watts of power and an SPL of 108 dB. By comparison, the Phantom has a peak power of 750 watts, while the Silver Phantom claims 3000 watts. We barely pushed the Silver Phantom to its full potential when we tested it, but we were more than impressed by the volume and bass levels it could achieve. The Gold Phantom claims to kick-out frequencies as low as 14Hz and highs up to 27kHz thanks to a new titanium tweeter. It’s also been fitted with a new version of the ADH processor found in the other Phantom models. The aluminium midrange and bass drivers remain, as does the ability to support hi-res audio up to 24-bit/192kHz. But as the name suggests, the Gold Phantom comes with a 22-carat pink gold-plated cabinet. You’ll be able to control the Gold Phantom via the Devialet companion app for iOS, Android, Windows and Mac and you can pair up to 24 units together for a multi-room platform. The Devialet Gold Phantom will be available to pre-order from July for £2190.